As you can see in the long tail diagram above, institutional investors aren’t interested in development projects that don’t require less than $5 million in investment. When you’re managing billion dollar funds, anything less than $5 million is just too small to influence the bottom line. However, the market demand for human-scaled development in the knowledge economy is largely left out. Read about the 19 conventional product types of the industrial age vs the 19 urban development types of the knowledge age here. In other words, while many of us would rather live in a more human-scaled built environment, our only choices may be block-long mid-rises, because only the latter is large enough to finance in today’s investment world. The tipping point is too high, and the result is a de facto built environment of monumental projects like you’ll find at GlobeSt.com, the de facto real estate investment news site. 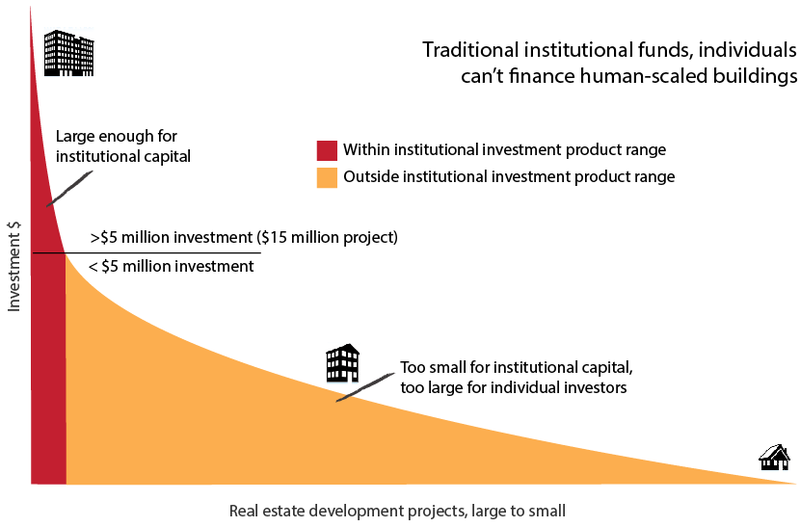 Hopefully sooner than later, but inevitably, the investment industry will cater to the long tail (ie the masses, or ‘everybody else’) and establish contemporary management structures that can handle a greater number of smaller development projects, as low as $6 million requiring $2 million in capital (ie a multi-unit rowhouse) – see diagram below. At the same time, crowdfunding will provide more financing options from the other end, letting the market finance their own preferences. That’s when you’ll finally see the 19 more creative urban development/place types define the new quality of life that creatives demand. [Update: See Fundrise pioneers crowd-invested placemaking]. Thanks to Jamal Williams of Red Dove real estate development for contributing to this entry. Also, see previous entry, Time for real estate investment to catch up to the market. Check out an extended version on Planetizen. Great piece Neil. Very interesting and nice perspective on investment capital and its environment.